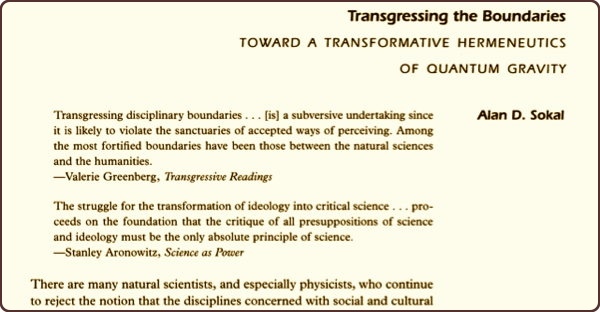 An article bearing the portentous title "Transgressing the Boundaries: Toward a Transformative Hermeneutics of Quantum Gravity" ran in the Spring 1996 issue of the cultural studies journal Social Text. At first glance the article appeared to be an unlikely candidate for controversy. It was written in the typical style of academic articles, slightly overbearing and verbose, and it came armored with a bristling flank of footnotes (more footnotes than actual text). 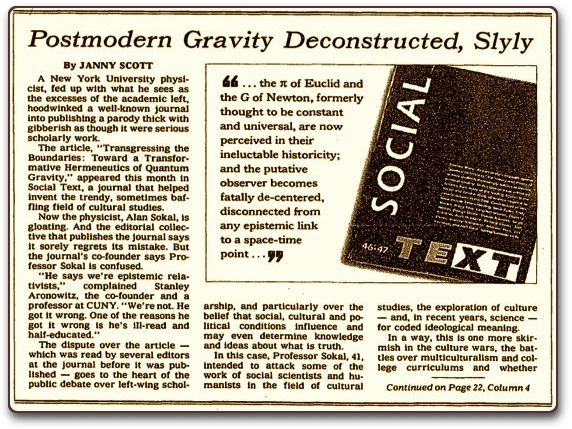 But on the day that the Spring issue of Social Text appeared in print, the author of the article, New York University physics professor Alan Sokal, published a letter in the academic trade publication Lingua Franca revealing his article was actually intended as a parody, a fact which the editorial board of Social Text had failed to recognize. "Any competent physicist or mathematician (or undergraduate physics or math major) would realize that it is a spoof," Sokal asserted. He suggested that his article's acceptance by the journal pointed to "an apparent decline in the standards of rigor in certan precincts of the academic humanities." 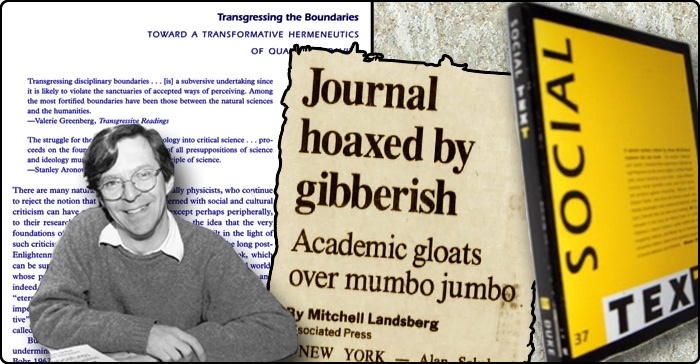 He also fumed over "how readily they [Social Text] accepted my implication that the search for truth in science must be subordinated to a political agenda." The New York Times ran the story of Sokal's revelation on its front page on May 18, and from there the controversy grew. Here my aim is to carry these deep analyses one step further, by taking account of recent developments in quantum gravity: the emerging branch of physics in which Heisenberg's quantum mechanics and Einstein's general relativity are at once synthesized and superseded. In quantum gravity, as we shall see, the space-time manifold ceases to exist as an objective physical reality; geometry becomes relational and contextual; and the foundational conceptual categories of prior science — among them, existence itself — become problematized and relativized. This conceptual revolution, I will argue, has profound implications for the content of a future postmodern and liberatory science. The hoax elicited many different reactions, but the most common response was laughter. Social Text, and by extension the rest of the cultural studies community, had been made to look like egghead intellectuals adrift in their ivory tower. Social Text responded angrily and self-righteously to the parody, but only succeeded in digging itself deeper into the hole that it had fallen into. Social Text prided itself on its embrace of radical politics and controversial views. Since its founding in 1979 it had published a variety of articles that were highly influential within the cultural studies community, including pieces by intellectual luminaries such as Cornel West and Michel de Certeau. Its editor, Andrew Ross, who cultivated an image as a hip, radical, intellectual celebrity, set the tone that the journal followed. Nevertheless, the truth was that the journal was not used to receiving much attention outside of its readership base, which was a small, elite group of academics numbering in the hundreds. It was certainly totally unprepared when Sokal's article landed it at the center of an international whirlwind of controversy. One of Sokal's specific targets that he designed his hoax to ridicule was the cultural studies concept of "social construction." Cultural studies, he claimed, advanced a destabilizing idea of cultural relativity that professed all forms of knowledge (voodoo, astrology, chemistry, etc.) to be of equal worth, because all were 'socially constructed.' The cultural studies community fiercely objected to this characterization of their ideas, but generally their objections were ignored. In this way, the Sokal hoax brought to light the cultural schism that had come to separate the humanities from the sciences in the American university system. Humanities departments had grown progresively more radical and liberal since the 1960s, flirting with and often openly embracing ideas such as socialism and cultural relativity. The sciences, on the other hand, fed by massive Cold War funds funneled to them through the Department of Defense, had remained far more conservative (though only in comparison to their counterparts in the humanities). The two had, for the most part, lived peacefully side by side until the humanities began turning their analytical tools upon the sciences themselves. When this happened, the scientists fought back. The Spring issue of Social Text in which Sokal's article appeared had, in fact, been devoted to a study of the so-called 'Science Wars' between the sciences and the humanities. The Sokal hoax recalled the satirical tactics that had been used to discredit modernizing influences in art and poetry during the early decades of the twentieth century, such as the Spectric poetry hoax of World War One and the Disumbrationist art movement of the 1920s. The Sokal Hoax: The Sham That Shook the Academy, LinguaFranca Books, University of Nebraska Press, 2000. Let me get this straight: Sokal writes a bunch of nonsense about reality not being real; then he *falsely* attributes that nonsense to writers like Jacques Derrida or Michel Foucault; and then that is supposed to demonstrate "the charlatanism and nonsense" of Derrida and Foucault? If I write a bunch of nonsense, and then falsely claim that Einstein wrote it -- does that mean I have demonstrated the "charlatanism and nonsense" of Einstein? Could it possibly demonstrate anything at all, other than the fact that these sad guys at Social Text really, really wanted to be "interdisciplinary" and include a scientist in their pages? Just in order to not let the wrong claim in the first sentence of the previous comment be uncorrected: Sokal's article did not make up any citations and did not falsely attribute anything; all quotes and citations in his article were accurate, as can be easily checked by comparing with the given original sources. What he did was to draw conclusions from these quotes that were (to a natural scientists understanding: obviously) nonsense; and his criticism of Social Text is about the fact they did not complain or note that his own alleged conclusions (which the article clearly presents as his, not somebody else's, thoughts) ar non sequiturs. What he in the fact also claims that some of the quotes (which were quoted at length, i.e. not torn out of context) contain striking non sequiturs in themselves. Thanks to the Post-Modernists, no one can say "social construction" without implying "meretricious swindle consciously designed to keep some undeserving cabal in power." No one can talk about something that's a "social construction, but there's nothing wrong with that." I am quite willing to accept the theory that, although there is a Reality Out There, all systems for dividing that reality up into categories, the better to hold it in our heads, are and of necessity must be social constructions. Reality just doesn't divide itself up that neatly, which is demonstrated by the fact that if you stare too long at any border between categories (particle/wave, plant/animal, even living/nonliving) it will start to blur on you, and you will discover things which are both and neither. The grid of categories that the common man uses is still basically the one devised in ancient Greece, with a few amendments made in the early Renaissance. Scientists have known for more than a century that this model is an oversimplification, and bears about as much resemblance to What Is Really Going On as that stylized map of the city's transit system that you see in the subway car does to a satellite photograph of the city and its transit lines. Maybe a total understanding of the workings of the universe is forever beyond us, but the universe is still there. And my own theory of the proper role of social constructions is a far cry from the radical assertion, "There is no Truth; there is only Power."